The Dollar Box: Dark Genesis! A new year brings a new Dollar Box column, where I look at single-issue comics stories with an original cover price of a dollar or less. 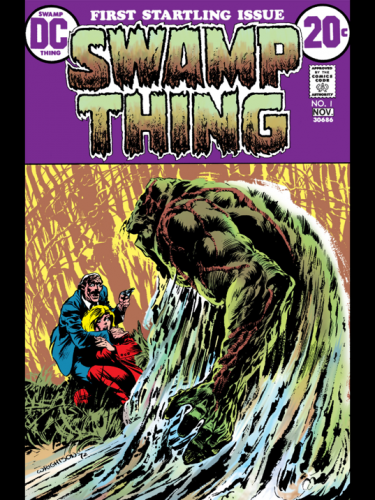 This month is all about swamp monsters, and while Swamp Thing isn’t the first of his kind (that would be The Heap), and not even the first muck monster from the Big Two (as Marvel’s Man-Thing debuted several months earlier), Swamp Thing is certainly the most famous and best-realized of all the the many fiends stalking the four-color funny book bogs. 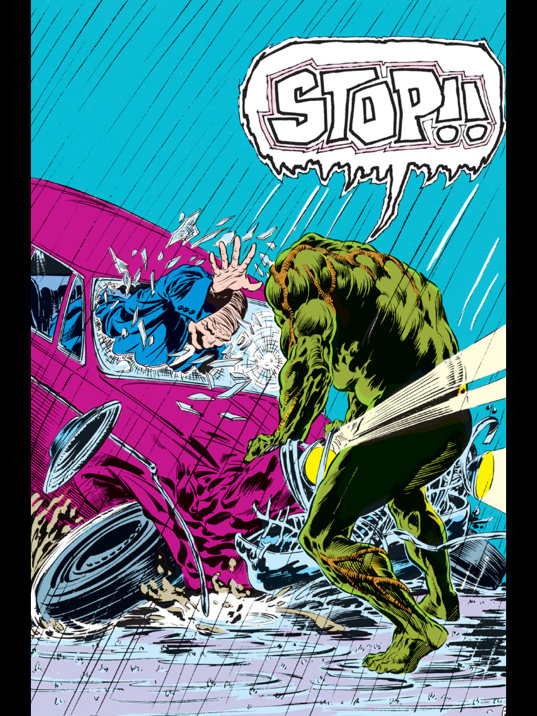 This is a taunt and effective horror comic, strongly-written by author Len Wein and lent an extra layer of creepy by the uncredited letterer, who employs drippy caption boxes to good effect. 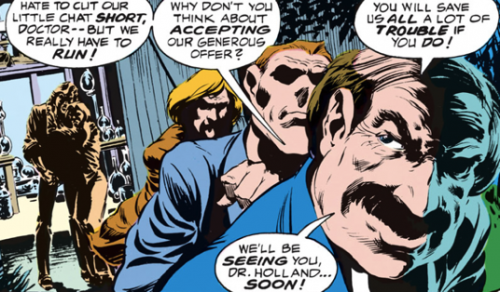 Perhaps that letterer was artist Bernie Wrightson, who put his stamp on every other aspect of the book, creating a swamp-gothic look on the fly — a world of shadowy locales that are still perfectly detailed, and populated with heavy-featured thugs rendered with such skill that you don’t recognize the degree to which the art uses comic exaggeration until you’ve read the book two or three times. It’s also a simple story, as befits the best origin tales, setting the table for stories to follow by introducing the main characters, and establishing our (anti) hero’s all-important powers and foibles. 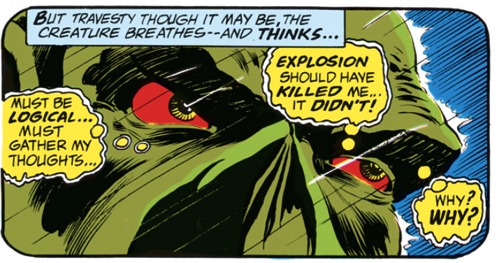 Of interest to fans of later incarnations of Swamp Thing (or readers slumming it after reading the minimally-sentient Man-Thing), this version of Swamp Thing is fully aware of what he is. I was never into the horror comics, but this looks pretty cool. Excellent artwork. So Wein called this “Dark Genesis”? Wasn’t Giant Size X-Men, which he also wrote, called “New Genesis”? 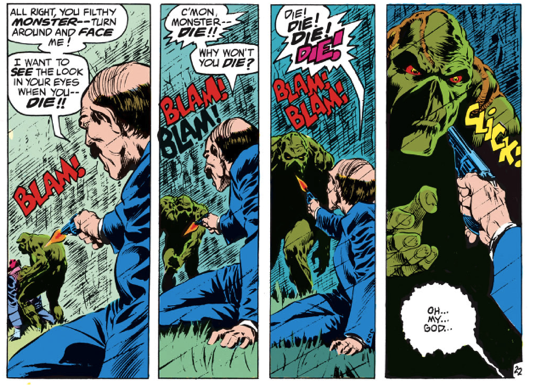 I have regretted not getting into Swamp Thing for some time now. I regret it more so now that DC has relaunched the title. 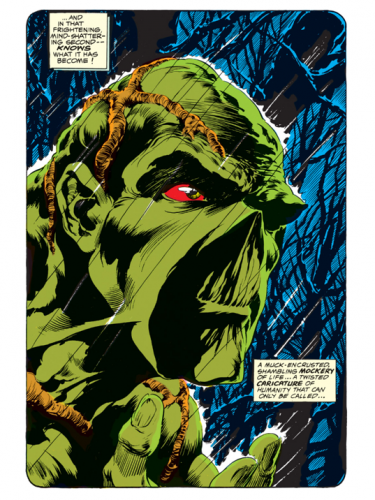 I’ve heard from older comic collectors I’ve chatted with that Swamp Thing is one for the ages. I think I’ll try to find that free digital story you mentioned in your posting, thanks for the heads up.